Despite the great plate count anomaly and the likelihood of a vast unknown microbial diversity, the role that microorganisms play in ecosystem processes has long been recognized if not yet fully understood. In addition to their genetic diversity, microorganisms exhibit a vast range of metabolic capabilities. Some are generalists with catholic tastes and others are specialists that recover energy from specific chemical transformations that only a small number of organisms can exploit. Metabolic diversity is particularly varied among the prokaryotes. 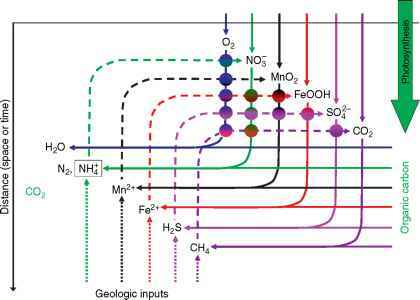 Different bacteria and archaea have evolved to occupy almost every niche that can be defined and collectively couple the oxidation of almost any reduced chemical species to the reduction of an astonishing array of chemical oxidants. The only factor that seems to dictate the limits of microbial metabolism is the thermodynamic yield of the reaction catalyzed. For this reason, microorganisms play a vital role in driving global biogeochemical cycles of elements and energy. The vast majority of photosynthetic carbon fixation in aquatic systems is accounted for by photosynthetic microorganisms. In addition to 'conventional' oxygenic photosynthesis, bacteria and archaea have evolved a wonderful array of mechanisms to harvest light energy based on light-energized electrons in several different anaerobic photosynthetic pathways and the use of novel light-driven proton and ion pumps. Many microorganisms play vital roles in the mineralization of organic carbon and transform an astounding array of complex organic compounds, many of which are highly toxic to other forms of life. Microorganisms degrade a huge array of petroleum hydrocarbons and can metabolize many xenobiotic compounds. There are even some anaerobic bacteria that have evolved to used chlorinated chemicals as their primary respiratory oxidant, even though these chemicals have only been synthesized and released to the environment in large quantities since the mid-twentieth century. Figure 3 (a) Conspicuous mats of giant sulfur-oxidizing bacteria from the genus Thiothrix in a sulfidic stream. These organisms are chemolithoautotrophs deriving energy for biosynthesis from the oxidation of reduced sulfur compounds. (b) Phase contrast image of bacterial cells (mostly green and purple sulfur bacteria) sampled from the anoxic hypolimnion of a small eutrophic lake (Priests Pot) in the UK. The square formations of cells are purple sulfur bacteria from the genus Thiopedia. Scale = 10 mm. (c) Epifluorescence microscopy of fluorescence in situ hybridization (FISH)-treated anaerobic methane-oxidizing aggregates. The archaeon (ANME-2 lineage) is labeled with Cy5 (red) and the sulfate-reducing bacterium (Desulfosarcina-Desulfococcus) is labeled with Cy3 (green). Scale = 10mm. (a) Adapted from Gray ND and Head IM (2005) Minerals, mats, pearls and veils: Themes and variations in giant sulfur bacteria. In: Gadd GM, Semple KT, and Lappin-Scott HM (eds.) 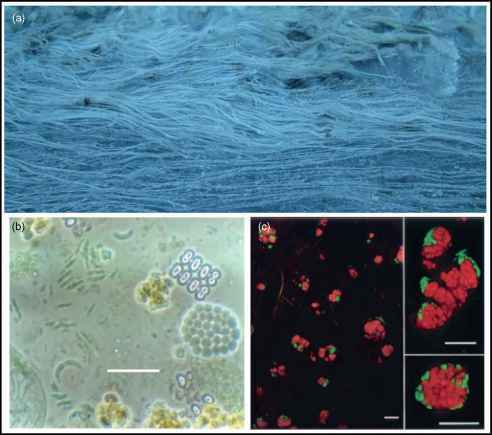 Micro-Organisms and Earth Systems - Advances in Geomicrobiology, pp. 35-70. Cambridge: Cambridge University Press. (c) Adapted from Knittel K, Losekann T, Boetius A, Kort R, and Amann R (2005) Diversity and distribution of methanotrophic archaea at cold seeps. Applied Environmental Microbiology 71: 467-479.
microbial groups have the capacity to use oxidized organic and inorganic compounds (oxidized sulfur, nitrogen, and metal species) as respiratory oxidants and some archaea exhibit unique forms of metabolism such as methanogen-esis where a limited range of organic compounds and hydrogen and CO2 are converted to methane in an energy-generating process. Microorganisms also carry out fermentation by which energy is generated without the requirement for exogenous electron acceptors. These go far beyond the glycolytic fermentation reactions that many higher organisms are capable of sustaining energy generation for short periods in the absence of oxygen. These redox-related process generate and consume protons affecting environmental pH and mineral solubility, processes which make microorganisms key ecosystem engineers. Energy-consuming microbial activities also influence ecosystems. Diazotrophs catalyse nitrogen fixation and, as such, are responsible for the conversion of atmospheric nitrogen into reactive nitrogen compounds such as ammonia and nitrate. These compounds are critical nutrients in ecosystems. In short, as a result of their metabolic activities, microorganisms have a direct and dominant effect on the global carbon, nitrogen, sulfur, and metal cycles. However, the full inventory of microbially mediated biogeochemical processes is almost certainly incomplete. This is indicated by the recent discovery of entirely new groups of organisms carrying out novel redox-coupled energy-generating reactions, for example, anaerobic ammonia oxidation by which oxidation of ammonia is coupled to the reduction of nitrite to form nitrogen gas. Additionally, from environmental genome sequencing, a mechanism ofharvesting light energy via a light-driven proton pump, long thought confined to a few extremely halophilic archaea, is now known to be distributed in a wider diversity oforganisms. These prokaryotes themselves have been discovered only relatively recently, yet are now known to be among the most abundant organisms in the oceans, typically comprising about 25% of prokaryotic cells in surface ocean waters. These light-harvesting processes were unknown less than a decade ago, but are now realized to be significant components of global cycles of energy and matter. In addition to their enormous metabolic repertoire, microorganisms can tolerate extremes of pressure, temperature, radiation, desiccation, salinity, and pH. Accordingly, they are found not only in lakes (Figure 3b), oceans, and soils but also in extreme environments such as hydrothermal vents and hot springs. They are also found in the upper atmosphere and the deep biosphere to depths ofseveral kilometers below the Earth's surface. As with higher organisms, microorganisms engage in a variety of biological interactions. In common with higher organisms, predation, parasitism, and competition are important facets of the ecology of microorganisms; they also engage in mutualistic, commensal, and symbiotic interactions. Many protozoans obtain food by ingestion of other organisms and many parasitic forms absorb nutrients directly from their host's cells. Viruses are obligate intracellular parasites and infect all known cellular life-forms including bacteria. They have little direct impact on ecosystem-scale processes, but by controlling the populations of biogeochemically active microorganisms they can have significant indirect effects. One excellent example of viral impact on a global scale relates to the cycling of sulfur, in particular the release of the volatile compound dimethyl sulfide (DMS). DMS is produced by a number ofmarine algae, the best characterized of which is Emiliania huxleyii. Under appropriate conditions, E. huxleyii forms massive blooms which can produce substantial amounts of DMS. The death of the algal bloom and release of DMS appears to be triggered by lysis of the E. huxleyii cells by viruses. When the DMS is transported to the upper atmosphere, it reacts to form oxidized sulfur species, which act as cloud condensation nuclei and enhance cloud cover exerting a cooling effect on the Earth. Thus viruses can have an important role in modulating large-scale Earth processes. There are many forms of mutualistic interactions in the microbial world which are responsible for driving key elemental cycles. For example, a vital component of the nitrogen cycle, nitrification, is often driven by a mutua-listic interaction between ammonia-oxidizing bacteria and nitrite-oxidizing bacteria. The ammonia-oxidizing bacteria gain energy from oxidation ofammonia to nitrite using oxygen, and the toxic nitrite provides an energy source for mutualistic nitrite-oxidizing bacteria which convert the nitrite further to nitrate. Such metabolic coupling is, however, much more prevalent in anaerobic systems where the accumulation of key metabolic end products (primarily hydrogen) can lead to inhibition of the producing organisms unless their low concentration is maintained by mutualistic organisms that consume the end products. These kinds of mutualistic interactions in microbial ecosystems are generally referred to as 'syntro-phy'. Syntrophy is the key to the anoxic mineralization of organic carbon. Complex organic polymers are degraded by hydrolytic microbes to produce monomers, which, in turn are converted to fatty acids and hydrogen by fermentative anaerobes. Often, it is methanogens or sulfate-reducing organisms that complete the mineralization process converting these products to methane and CO2 (methanogens) or sulfides and CO2 (sulfate reducers). However, there is a far wider range of organisms that participate in these kinds of interactions including iron- and manganese-reducing microorganisms. Critically, without these terminal consumers, many degradative processes grind to a halt through the buildup of metabolic intermediates. Syntrophic consortia can be free living and the interactions can occur between a range of species. However, syntrophic interactions are also a feature of much closer symbiotic relationships with animals and protists such as protozoa, amoebae, and flagellates. Many anaerobic ciliates harbor symbiotic methanogens which consume hydrogen produced by a specialized organelle called the hydrogenosome, which is involved in energy metabolism in anaerobic ciliates, much in the same way as mitochondria are essential for energy generation in aerobic eukaryotic cells. Ruminant animals benefit from these syntrophic processes by direct absorption of the fatty acid intermediates of cellulose degradation or through the digestion of dead microbial biomass. The syntrophs benefit from the anoxic, buffered, high-temperature conditions of the rumen and a continuous supply of organic carbon. Anaerobic oxidation of methane also appears to require the close interaction of two microbial partners. The specific details of the interaction are not fully understood; however, one of the partners, an archaeon, produces hydrogen and CO2, acetate, or possibly another metabolic intermediate from the oxidation of methane. The metabolic intermediates are consumed by the second partner which is usually a sulfate- or nitrate-reducing bacterium, though in theory other anaerobically respiring bacterial partners could fulfill this role. The organisms involved in anaerobic methane oxidation form close physical associations and can be observed as distinctive balls of cells where the primary methane oxidizers are surrounded by a crust of the sulfate- or nitrate-reducing bacteria (Figure 3 c). Microorganisms also enter into symbiotic relationships with plants mostly through root interactions. For example, mycorrhizal fungi form symbiotic relationships with plants where they typically derive organic carbon from root exudates while benefiting the plant by increasing the availability of mineral nutrients. Probably the best known symbiotic interaction between bacteria and higher plants is that between nitrogen-fixing microorganisms of the Rhizobiaceae, which are found in the root nodules of leguminous plants. This kind of interaction is however much more varied; for example, Frankia spp., Grampositive bacteria forming the phylum Actinobacteria, are known to form nitrogen-fixing symbioses with woody plants. Bacterial-invertebrate symbioses are widespread and endosymbiotic relationships occur between chemo-lithoautrotrophic bacteria and animals such as tube worms and clams. These relationships occur in hydrothermal vents and cold seep biological communities where the endosymbiotic bacteria oxidize reduced compounds such as sulfide and methane to generate energy for biosynthesis. The host animal benefits from the transfer of organic carbon produced by the bacteria and essentially leads an autotrophic lifestyle, courtesy of their symbiotic bacterial partners. Fascinating interactions are also involved in the symbiotic association of luminescent bacteria and squid and other invertebrates, and symbiotic bacteria from the genus Wolbachia present in the tissues of parasitic filarial nematodes are responsible for the observed pathology of filariasis. Many insect species also harbor endosymbiotic bacteria which are essential to the survival of the insects in the environment, the most well known of which is the relationship between aphids and bacteria from the genus Buchnera. Perhaps the most significant endosymbiotic relationships are those that gave rise to the presence of mitochondria and chloroplasts in eukaryotes. These organelles represent the establishment of an ancient bacterial residency within some eukaryotic organisms which most likely gave the impetus for the development of structurally more complex multicellular life-forms.